The Topcon AT B2 Automatic Level allows surveyors and construction professionals to perform highly accurate leveling, angle, height, as well as distance measurements. This optical instrument has 32x magnification, 1/32 inch accuracy, and a built-in compensator that stabilizes the line of sight despite the fine vibrations caused by heavy equipment on the jobsite. Featuring a focusing range of 7.9 inches in front of the telescope, the AT-B2 facilitates working in confined spaces. With an internal magnetic dampened compensator, this survey and construction tool levels the line of site within the range of ±15 arc-minutes and an accuracy of 0.3 arc-second. For working in extremely confined spaces, this auto level allows you to use an optional diagonal eyepiece, an optical micrometer , a light pack for leveling in low light conditions, and a 40x eyepiece for improved accuracy and magnification. With the AT-B2 automatic level, the rotation speed of the focusing knob is automatically switched between coarse and fine, allowing for quick and precise focusing. In addition, the fine horizontal knobs located on both sides of the instrument can be operated without clamping, speeding up aiming procedures to the staff and other objects. Horizontal angles can be directly read in degrees or gon and can be viewed just below the eyepiece. Protected against dirt and scratch, the horizontal circle features free rotation that enables you to read any angle from zero. The ATB2 also allows you to easily view the circular level through its integrated pentagonal prism without changing your eye height. With the IPx6 rating, the AT-B2 auto level is protected against powerful water jets from all directions. The advanced protection design not only prevents water from entering the instrument, but also deters clouding or condensation inside the telescope. 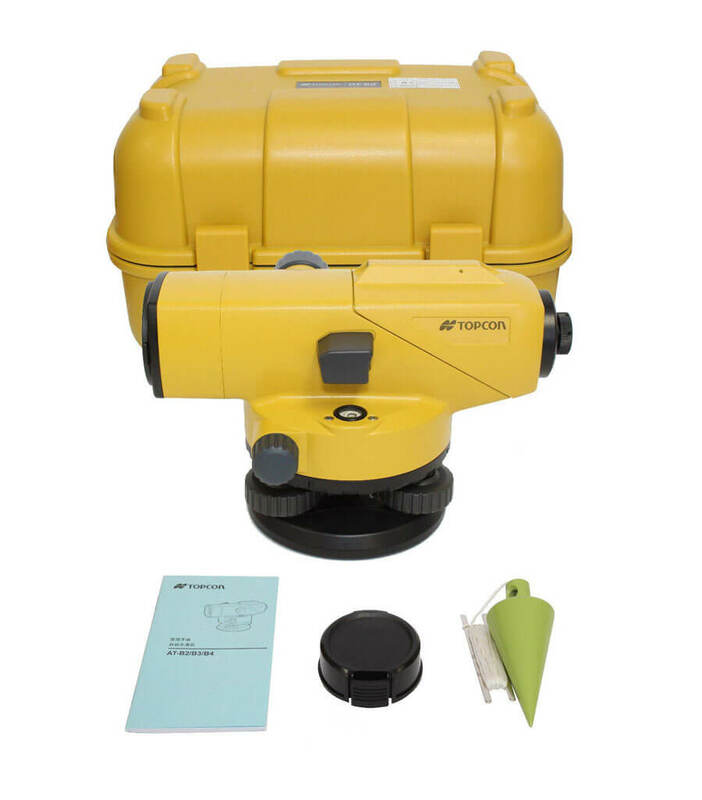 This Topcon automatic level comes with a hard carrying case, plumb bob, hex wrench, adjusting pins, vinyl cover, cleaning cloth, lens cap and 5-year manufacturer’s warranty.